Is it true that loom bands for weaving can cause cancer? Weave bracelets out of scrap materials – one of the most popular women's hobby. 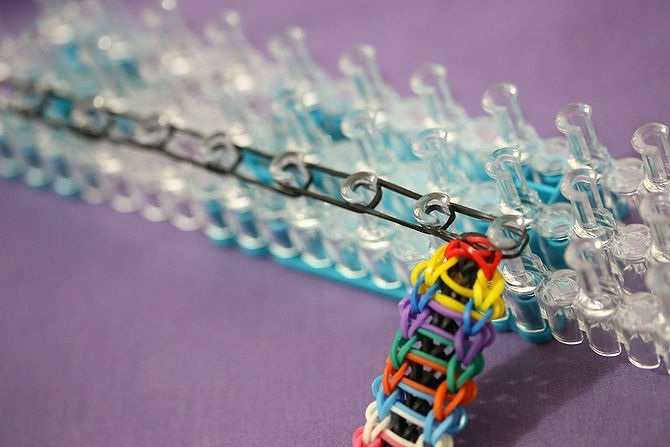 More convenient and easiest way to make bracelets out of rubber bands because of their accessibility and the numerous schemes of performance – fingers, fork, loom, and others. 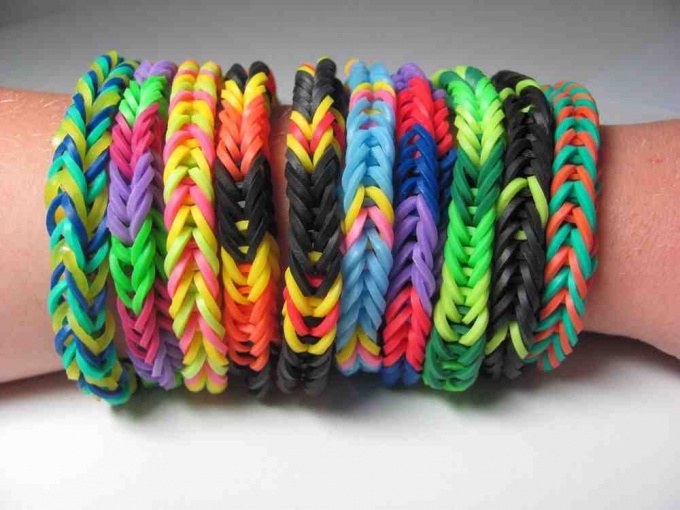 You can weave a variety of bracelets from rubber bands Loom Bands that can be purchased in the store or on the market. 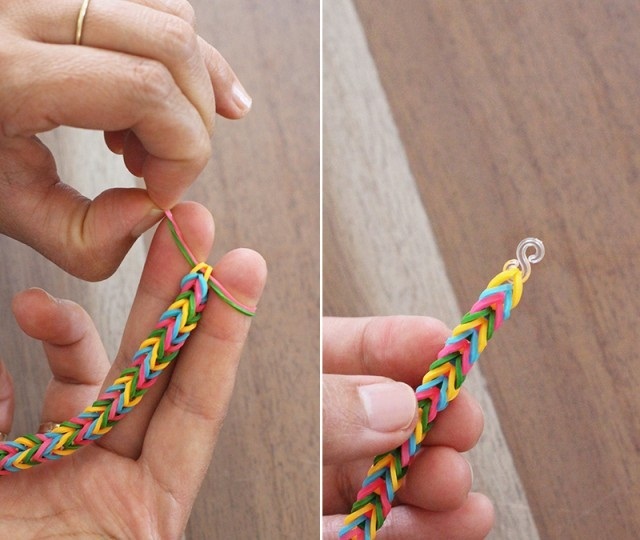 Make a simple loom bands bracelet that is also called "eight". Pull the index and middle fingers twisted figure eight elastic, place on top another, but not curled. Carefully remove with your fingers first, and thread through the second. Continue with this unique and colorful necklace. Once you reach your desired length, secure the ends with plastic lock or make a small knot. Can be trained to do several of these bracelets, and you will quickly learn how to make bracelets out of rubber bands on the fingers. Try to weave a bracelet out of rubber bands as three-dimensional wiring, a so – called "fishtail". For this you will need about 50 rubber bands. Start it the same as in the previous method: the index and middle fingers put on "eight", but the following bands already do not twist. Place the top two rubber bands of any color through them and remove "eight". Pull the bottom loop through the top so that the last one left on the fingers, then repeat the sequence until you have completed the bracelet. 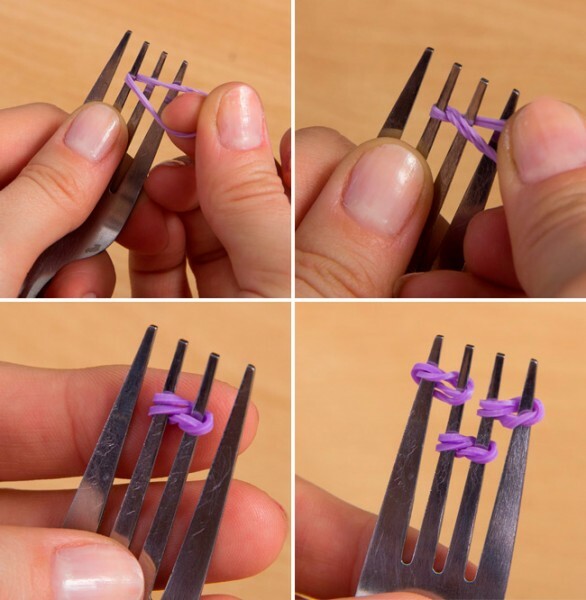 Twist and fold the elastic in half one in the eight and put two fork tines in the center. Then repeat the same with the other two bands, but wearing them on the extreme left and extreme right two prongs. Remove the first elastic band over the middle of the loops by sliding the whole workpiece down. Double twist another rubber band and attach to the middle teeth, but not turn eight. Carefully remove the previous number on top of the last clip, and then repeat the sequence in the form of a gum in the center and two on each side, making two rows for each color. After creating the bracelet is the desired length finish the weave by moving the loop from the extreme to the middle teeth, and the lower loop, place on the top. The remaining two loops on the center, put on new braided twice gum. Place loops on top of it. Side loops are put one over another as the fastener in the form of the letter S. to cling to the hinges and carefully remove the finished bracelet with a fork. Spread your nodules, slightly stretch the fabric and fasten one end to the other. If you have a special machine with one row of the columns you can make bracelets out of rubber bands in the style of "dragon scales". In addition to the colored rubber bands you will need a hook and four clasps. Make the first row of the four eights of the same color, having them in one. Fill in the blanks with rubber bands of another color, twisting them away. On columns with double layer loop the hook of the lower loops. Pull the number down. Put one non-twisted ringlet columns with a double row, loop the bottom loop on the top, leaving the free one on the left. Go down and start a new row of a different color from the first column, as the previous one. After making the desired number of rows, remove the outer loop and slip into a neighboring column, repeating from the opposite end. The next loop on the left side slip into the neighboring column on the right. In the result of the loop would be four columns, and fasten snaps.